Burritos + Coffee might strike you as an unlikely pair. The duo, though, was exactly the sort of fresh food affair we were missing after relocating to Hilton Head Island from Miami. Craving South Florida’s scratch-made, zesty combinations exploding with fresh produce, we set out to do it locally, our own way. 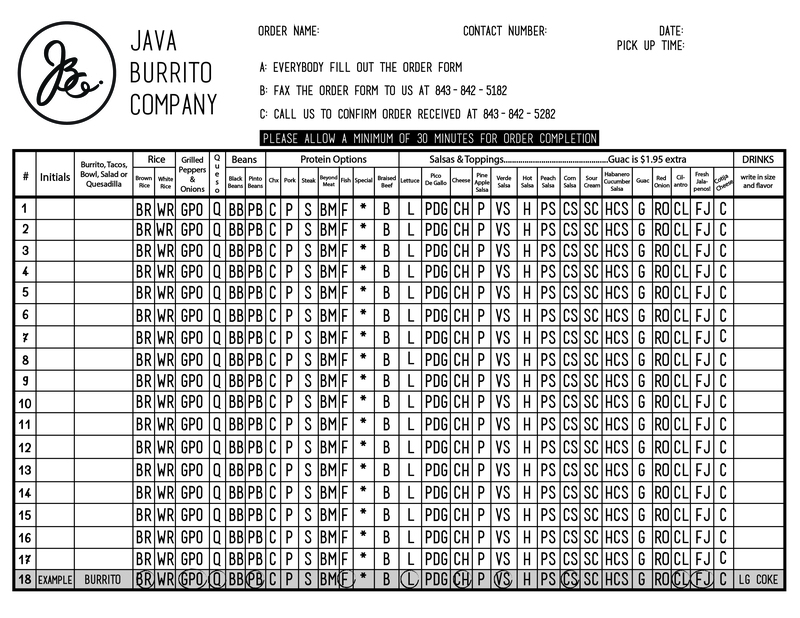 The Java Burrito way. A fast, fresh, casual experience coupled with a priority on customer service while supporting local and preparing fresh every single day. Our fresh food eatery sources both organic and local food when in season. We never use artificial preservatives and absolutely no growth hormones or antibiotics. We pride ourselves on using fine ingredients and traditional methods, preparing daily to produce only the most exceptional products. Our Coffee Bar sources locally-roasted and organic beans, local milk and organic cane sugar syrups. Our philosophy promotes positive change within the sustainable farming initiative, supporting farms and individuals with like standards. We believe in keeping our farmers close. Local goes beyond farm fresh sourcing, though. At Java Burrito, our local community is just as important as our local ingredients. From the loyal customers who wholeheartedly support us to the new customers who excitedly embrace us, we have learned that risking it all for what you love is well worth it. Our relationships with you inspire us to open our doors with increased enthusiasm each and every day. Every customer counts and every new relationship is just as special as the last. Whether we’re your go-to coffee spot, farm to fork favorite, reliable caterer, happy hour home, or the place where you get your burrito just the way you like it, we’re forever grateful you love what we love to make.